Earnings from my sites hit their peak this month, setting an all time record. But sadly its not setting a trend, its the peak before the fall. It was a final fling before the full extent of the change in cookie at my major merchant comes into full effect. But before we talk about that, let’s talk about everything that made August an awesome month. I was expecting a big drop. I’m still fairly new online and haven’t had time to really see trends on my own sites, but everything I read told me that August was a low traffic month as people took their vacations, kids were off school, the weather is good and people have got better things to do than look on the internet (good for them!) However the drop didn’t come for me – it was another record month for traffic. Pinterest has been growing enormously. I know this is a really important site for traffic, but I’ve not really been using it to my full advantage. My theme shows extracts on the front page with a featured image. It sets the width of the image the same on the front page, so to keep things looking neat and regular, and because they show up better at linky parties, I’ve been using a square featured image. However a square image doesn’t work so well for Pinterest, where a longer image looks better. So I changed up my Pinterest strategy and created TWO pinnable images for each post. The featured image continues mostly to be square or squareish, but now at the bottom of the post I also include a PIN ME image which is in a better format for Pinterest. You can see an example of this in this article for a soft toy. I’ve certainly seen more Pinterest traffic and repins as a result on the few articles I’ve done this on so far. I’m thinking it would be a great idea (if I ever had the time) to go back through some of my most popular posts and add a new Pin-able Image at the bottom for those too. Pinterest traffic has roughly doubled in the last 2 months from 655 visits in July to 1361 yesterday. Google and search engines – I lamented for a long time on these pages about why a Google update took away so much of my search engine traffic overnight last year. Then I woke up one morning and found it was back, and more than before by a good way. Thank you Google for recognizing my content. I’m keeping quiet in case I jinx it, but this is now easily my No 1 traffic source every day. Here’s the graph for this year in total. I’m a firm believer that it’s not so much what you do, as what Google does when it comes to SEO. Certainly I didn’t change my way of doing things – they did and look at the result. So did my bounce rate and time on site suffer as a result of all this new traffic? Did the readers stay and engage or just bounce away again. These indicators must surely tell Google whether my site is worth ranking well. Let’s see. The good news is, bounce rate fell slightly from 15-16% down to 12-13%. Time on site and pages per visit has been pretty even at around 14-15 minutes and 1.9 pages. So keeping my fingers crossed that this good fortune continues. Facebook – love it or hate it, Facebook still has a role to play in driving traffic to your site. I joined a sharing group with 6 other bloggers. Once a day we all share a post from one of the other members. So this gives me relevant content to post to my page without having to go look for it, and at the same time, I know someone else is sharing the post that I selected for this week. I’ve not really noticed a lot of extra traffic, because at the same time, the number of people seeing my own posts has sharply declined. I had been getting around 3-7000 people seeing each post, but its really dropped in the last couple of month to often less than a thousand and rarely more than 2,000 despite my followers increasing this year to over 16,000 now. Personally I’m finding FB too spammy these days. My news feed is suddenly full of çlick-baiting’ style adverts placed there by FB themselves – ‘you might also be interested in’ type of links. I’m hating that and I’m thinking FB use will decline as a result. Sewing pattern sales – a record month for pattern sales. I released the Color Block Dress and its been the fastest selling pattern yet. I’ve also started selling patterns through a couple of small online retailers so this added a few dollars income. I’ve got an exciting project coming up shortly in conjunction with an overseas magazine – will report back if that comes off. Advertising revenues – with increased page views comes increased advertising revenue. Good figures from Adsense and Blogher this month. I also started trialing another ad provider, but its not worked out. Although they do pay more per view, I’m getting around 15-20% lost impressions in the process where no payment is being made, because of ‘latency” in their process. So after a trial of 6 weeks or so, these are being replaced by another Network who promises big things. Will report back next month how that works out. I get a lot of emails asking about which merchants to use on ShareASale. Generally there are some which are good for me, some which are good for you and some which will good for someone else. It depends on your site, your niche and your readers. I’ve recently updated this older article with a few recent offers, so take a look here and apply to some of these to get you started. I also did an article about BuyCostumes, which I’ve just added to my selection. Which Merchants should I sign up with on ShareASale? So I’m confident in saying that the peak of earnings was reached this month, but I don’t think I’ll starve! Still having so much fun and really enjoying what I do. Funny how things turn out! Congratulations. Love learning about your business in social media. I can’t wait to check out your soft toy as my sister in law is having a baby. And I agree. Facebook can get annoying with so many advertisements. I’m spending less and less time on that site. Congratulations! I am glad to see that your patterns are doing well, the dress is gorgeous, so no doubt it was the best seller! I am wondering about Google. Do you know what percentage of people click on your website vs the times your blog shows on Google? I think mine is about 10% which I find it very low. Mine varies a lot depending on the position and the page. Anywhere from 5-50% ! Those with the higher average search position get the highest click through rate, especially anything in the top 3. Anything ranking from 11 onwards is very low. I love to see these posts come into my bloglovin email. I click on it as soon as I have a free moment. Today I spent a lot of time on your site. I am just starting my blog/business and love to learn from you. I am so close to launching my official website. Thank you so much for taking the time to share your income and the ups and downs of your blogs for those of us who are learning the ropes. I really appreciate it. Wow Deby! Another great month! I’m going to be watching what happens for you in September. It should be interesting. Thanks so much for sharing your info with us. It’s very inspiring. Love the income report. And its the first one I have seen where passionfruit has been listed as an expense. Keep meaning to sign up for them but everytime I think of doing so I manage to sell all my ads spaces without them. They really are more of a way of managing your spaces rather than selling them I think. I find it easy to allow my advertisers to set up their own adverts, schedule them, change the graphics etc when they want, renew etc. I just sit back and the whole thing takes care of itself. I am really feeling proud to see a blogger’s income because I wants to be blogger in future. If possible then please share the traffic method that you have used . Have you used only organic and social media traffic or also others? I’ll try to remember next month to include more info of where all of my traffic came from, without giving away all of my secrets! 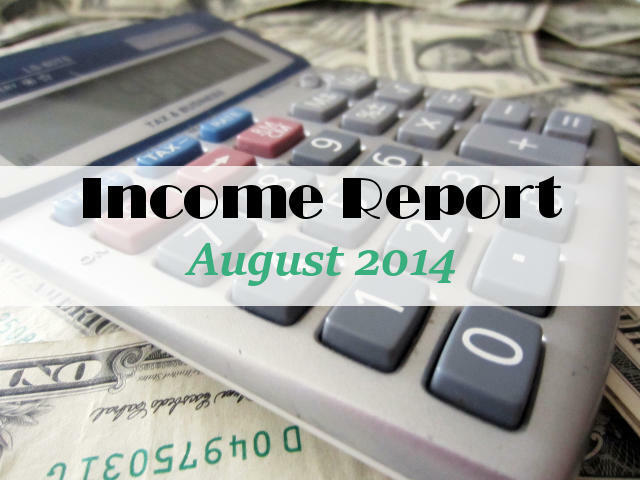 Thank you for taking the time to share this income report. As a blogger it is refreshing to find someone who is not trying to ‘hide’ what they make or how they make it blogging. I love seeing the different affiliates that work well for you. Congratulations, Your blog is really doing well. Your blog is an inspiration for people who are not able to make any bucks online. Moms make money is a famous blog. I found this blog name at many places and decided to visit your blog.